Dream Pod 9 has been working on some new laser etched and cut acrylic Game Token Packs with the team over Impudent Mortal for the last few weeks. We don't have pricing worked out yet, we'll have that sometime next week. Special thanks to Walt over at Impudent Mortal for the great work on the tokens and getting photos taken so we could show you all how they turned out. Above is a preview of the Northern Commander Token Pack with the North logo laser etched in blue acrylic. We plan to make Commander Token Packs for 10 Factions (North, South, Peace River, NuCoal, Leagueless, Black Talon, CEF, Caprice, Utopia and Eden). Each will include four numbered (1 to 4) 40mm round Objective token markers, five close cut 30mm Victory Point tokens, four 25mm square Skill Point tokens (S for Skill Point and Square shape), two 25mm round Command Point tokens (C for Command Point and Circle shape), and one Heavy Gear Blitz Measuring Tool for fast 0.5", 1", 1.5", 2", and 3" measurements. 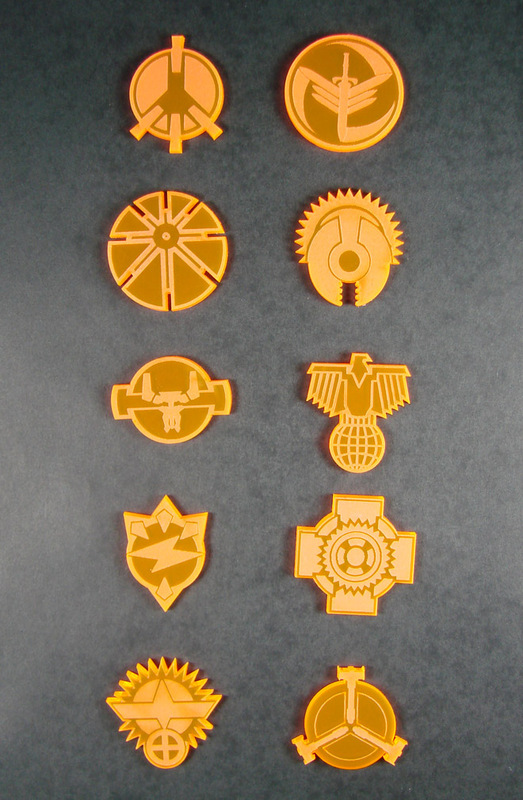 Below is preview image of a test laser etching and close cut of the various faction Victory Point tokens in orange acrylic for the planned Commander Token Packs. The average size of these is around 30mm in diameter and each of the 10 factions will be in a different color acrylic. 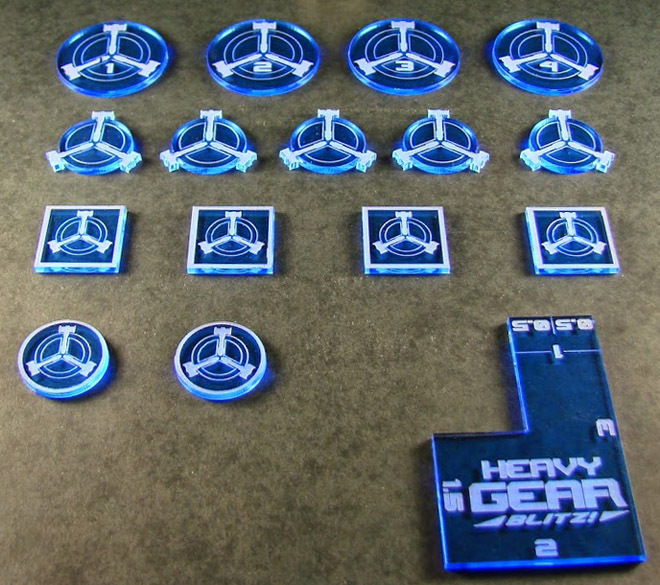 Plus here is a preview of the planned Heavy Gear Blitz Status Tokens Pack. It will include 27 laser etched and cut acrylic Status Token which are about 20mm in size. Details of what all the new Status Tokens are used for will be included in the upcoming Living Rulebook Beta, that we are still presently working on. 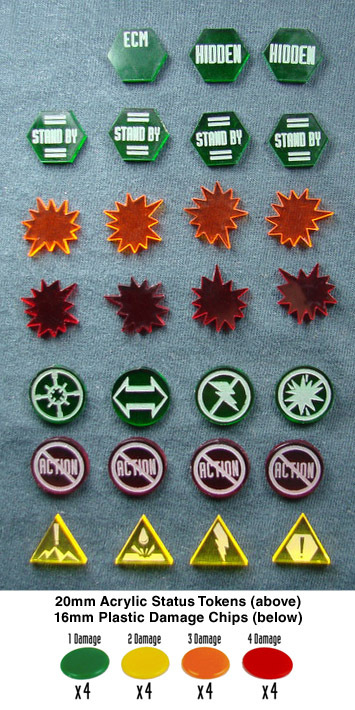 The pack will also include 16 plastic damage chips which are 16mm in size (4 green, 4 yellow, 4 orange, and 4 red). These are the same chips that were included in our old Blitz Counter Packs, so players can continue using them to keep track of damage. If you want to checkout some of the other great products that Impudent Mortal makes you can click the link below and checkout their website.